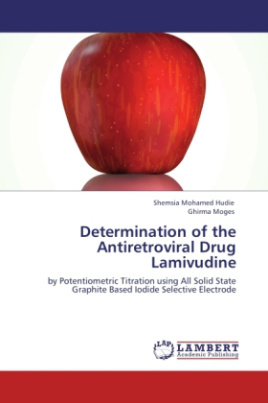 A solid-state iodide selective electrode with Ag2S-AgI adsorbed on graphite rod, recovered from a dry cell, was prepared and validated for its typical response characteristics with an objective to develop a potentiometric titration system for rapid measurements of Lamuvidine (LMV) in tablets used as an antiretroviral drug for Hepatis B and HIV patients. The partial validationexhibited typical response values of linear range of 10-6 to 10-1 M iodide and a slope 57.57 mV/decade which reasonably agreed with early data from our Laboratory.The basis of LMV determination is its oxidation by excess bromine generated from bromate-bromide mixture. The unreacted bromine oxidized the added excess iodide to iodine. The amount of bromine consumed by LMV, the basis of its determination, was determined by subtracting the back-titrated iodine with thiosulphate whose end-point was located potentiometrically with the solid state iodide selective electrode against a reference electrode. The iodometric back titration provided for the indirect determination of 1-30 mg LMV in turbid tablet test solutions.